Roasted garlic is one of the best ingredients you can use to jazz up a recipe. It packs an incredible amount of flavor, and can be used in many ways. 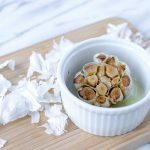 Learn how to roast garlic in the oven or on the stovetop with this quick step-by-step tutorial! Learning how to roast garlic was a total game changer for me. It might just be one of my favorite things. You can use it to add so much flavor to a variety of dishes like hummus, aioli, bruschetta, sandwiches… or pretty much any other savory recipe. On top of that, roasting garlic makes the kitchen smell absolutely amazing. It adds depth, savoriness, and subtle sweetness to so many recipes. You can even smear it directly onto crostini along with a pinch of salt for a simple yet fantastic snack. Roasted garlic is garlic (typically whole bulbs but it can also refer to individual cloves) that has been coated in fat, typically olive oil, and cooked in a high heat oven until the cloves are caramelized, soft and fragrant. 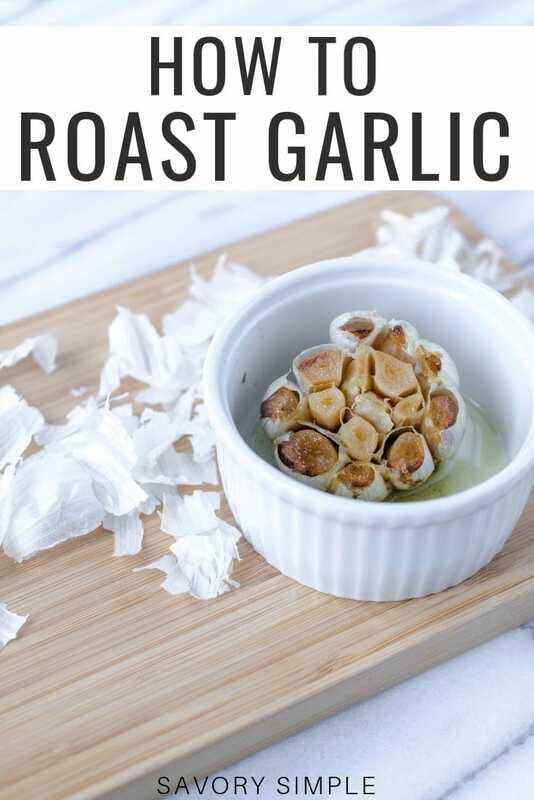 Roasting garlic removes the pungent, sharp taste and crunchy bite from raw cloves, replacing it with a paste-like texture and mild, and slightly sweet flavor. It can easily be mashed into a paste, and the cloves squeeze right out of the skins when gently pressed. This technique is very easy. While the oven is preheating to 400 degrees F, you want to peel off the papery outer layers of the bulb while leaving the cloves attached to the root end (see the photo above; the round, hairy side is the root end, and the thin, pointy side is the stem end). Next, slice off the very top of the stem end, exposing the ends of the cloves. Place the clove in a ramekin (or on a piece of aluminum foil if you don’t own a ramekin). Drizzle a bit of olive oil and salt over the garlic, then cover the top of the ramekin with foil. (FYI: I prefer using a ramekin because I find it less messy than only using foil. Less chance of spill). Roast for 35-40 minutes, or until the cloves are soft and caramelized. Once the garlic is cool enough to handle, squeeze out the roasted cloves! You can also save the garlic infused oil to drizzle over salad or veggies. It can be frozen for up to 3 months. Place the roasted garlic in a small sealed container or resealable plastic bag before freezing. I defrost it in the microwave. Can Roasted Garlic Go Bad? Roasted garlic is perishable and will eventually go rancid. It will likely keep in the refrigerator for up to 2 weeks, but I recommend using it within 1 week for best results. If you won’t finish it in time, you can freeze it, as noted above. What Does It Mean If My Garlic Sprouts? If you’re garlic is growing little green sprouts, that means the bulb is getting old. It’s still safe to roast and is actually a perfect time to do so! You can read more here: What Does It Mean When Garlic Sprouts? 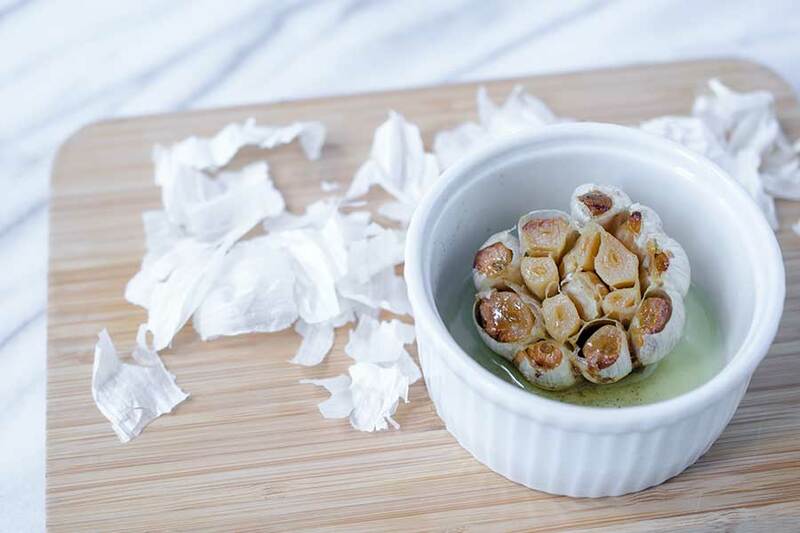 Now that you’ve learned how to roast garlic, I bet you’re craving some garlicky recipes! Check out my Roasted Broccoli with Garlic and Lemon, Crispy Baked Chicken Thighs, and Sheet Pan Shrimp Scampi! Trust me, these recipes do not skimp on the garlic. 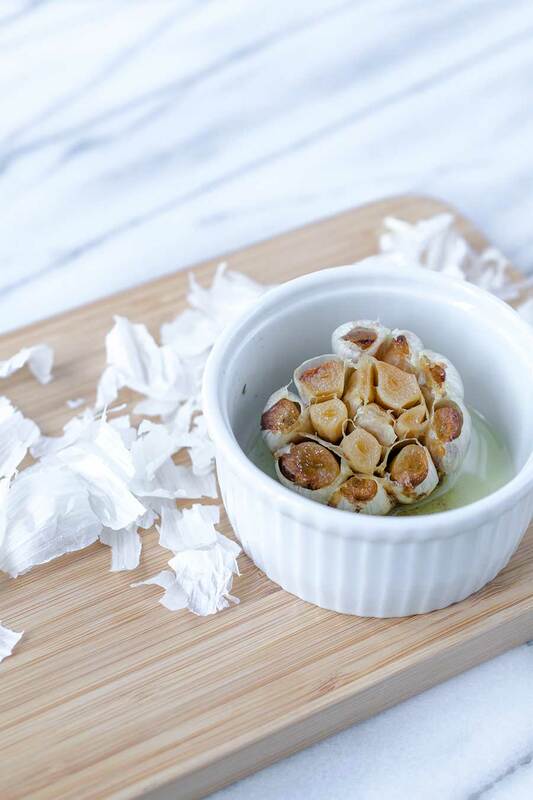 Learn how to roast garlic in the oven or on the stovetop with this easy step-by-step tutorial! 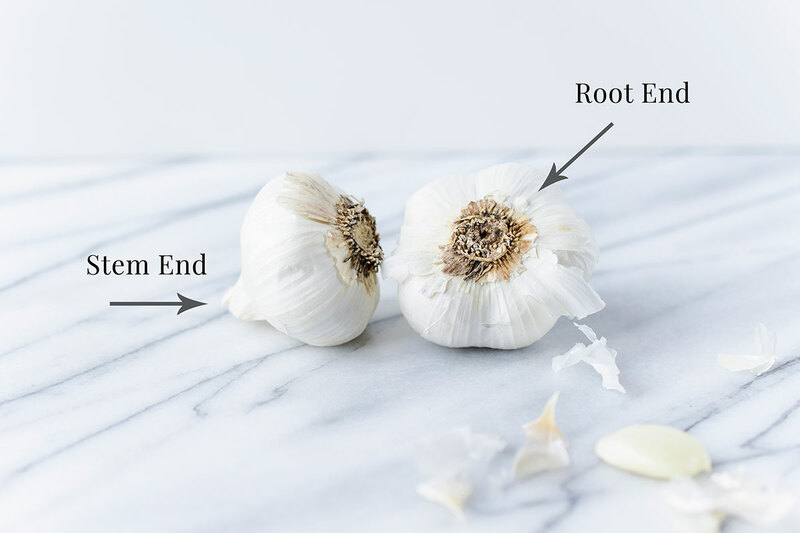 While leaving the bulb intact so the cloves stay connected, peel away most of the papery outer layers of the garlic. 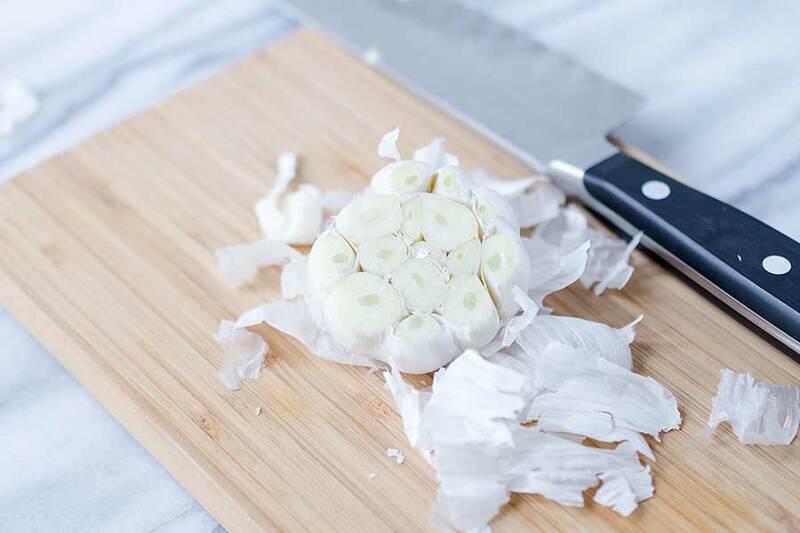 Using a sharp knife, slice off about 1/4-inch from the top of the garlic, exposing the tips of the cloves. (Note: you want to slice the pointy stem end, not the root end with the little hairs. That's the side holding the cloves together). Place the clove in a small ramekin, sliced side up. Drizzle 1-2 teaspoons of olive oil over the exposed cloves, then sprinkle lightly with salt. Top the ramekin with aluminum foil. (Note: if you don't have a ramekin, you can lay the garlic down on a piece of foil, then wrap it up after adding the oil and salt). Place the ramekin in the oven and roast for 35-40 minutes. The exact time will depend on the size of the bulb. You'll know it's ready when the cloves are completely soft and caramelized. If you like, you can continue pushing that caramelization for another 10-15 minutes to deepen the flavor. Let the garlic rest until it's cool enough to handle, then squeeze the bulb to remove the cloves. Use immediately, refrigerate for up to 1 week, or freeze for up to 3 months. This recipe can be scaled up to roast as much garlic as you need. If you're roasting several heads at once, you can skip the ramekin and securely wrap each one individually in foil. Place them on a baking sheet to avoid any oil drips in the oven. This is one of my all time favorite kitchen techniques! It makes everything taste so much better! I love roasted garlic! It’s a much better flavor in my opinion and we do this often! Love how easy your recipe is!